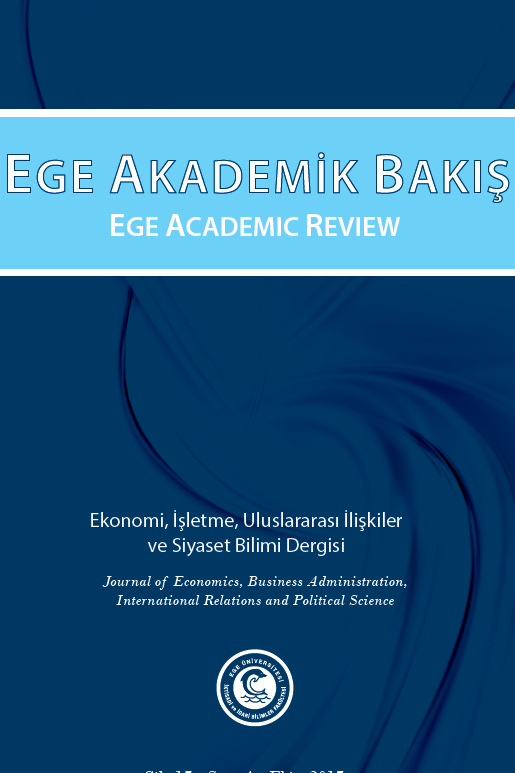 Ege Academic Review publishes articles on economics, business administration, international relations, and political science to provide a forum for the exchange of ideas among academics, researchers, and professionals interested in these fields. Ege Academic Review is based at the Faculty of Economics and Administrative Sciences, Ege University and published four times a year, in January, April, July, and October. It is a peer-reviewed journal and welcomes contributions only in English. All submitted works must be original, must not have appeared elsewhere, and must not be submitted for publication elsewhere while under consideration by Ege Academic Review. Those works which have been presented in conferences and whose abstracts have already been published can be accepted for consideration on the condition that the presentation and publication dates and places are stated to the editor. Authors who wish to withdraw their submitted works for delays or any other reason should write to the editor. Submission of a manuscript for review is assumed by the editorial board the acceptance of these conditions by the authors. There will be no royalty payment to the authors. The editorial board reserves the right not to accept manuscripts for consideration if they do not follow submission guidelines, to return them for revisions, or to organize them in the house style. All submitted works for publication undergo peer review, based on initial screening by editors and subsequent double-blind refereeing by at least two reviewers. They are published only if they are found proper for publication. The working languages of Ege Academic Review is English. Manuscripts and all editorial correspondence should be addressed to: The Editor, Assoc.Prof. A. Nazif Çatık, Ege University, Faculty of Economics and Administrative Sciences, The Journal of Ege Academic Review, e-mail: eab@mail.ege.edu.tr. Manuscript submissions to the Journal of Ege Academic Review must be made using the online manuscript submission system at http://dergipark.gov.tr/eab. Users should register when accessing the online system for the first time. If you experience any problem with the online submission please contact with the journal secretariat. First, the type of manuscript whether business, economics and international relation should be determined. Then materials to be submitted are controlled from the submission checklist. The dialog box appearing in this step can be used to contact with the editor. In this stage, author’s names and addresses, title and abstract of the paper is saved to related fields. Submission of keywords and JEL codes accurately are of great importance. Information here will be used by scientific databases and search engines. The file including the manuscript is uploaded by following the instructions in this stage. THE MANUSCRIPT CONTAINS NO CLUE REGARDING THE NAME OF THE AUTHOR AND AFFILIATION. The instructions on the manuscript structure are provided in the submission guideline section below. In this stage, submission is finalized after running a final check of the uploaded files. If the paper is rejected by the Editorial board, authors do not have to pay a fee. If the paper passes the preliminary assessment process by the Editorial board, of $50 should be paid to the bank account provided by the Journal Secratariat as the submission fee to cover processing costs. The manuscript will be sent to referees when the scanned copy of the bank receipt of payment is e-mailed to the Journal Secratariat. Studies should be written as one column. Paragraphs should have an indent of 0,5 cm. Line spacing should be 1,5. 4- Page Limitation - A study composed as explained above should not exceed 25 pages (1000 words). 1. Heading - Main section headings should be centered and bold. The main section heading should be coherent with the text and should be describing it. There should be a * postscript and explanation if the study is previously presented or composed out of a thesis or a project. 2. Author Names - Author names should certainly not be included in the application file. Applications including author names are not processed and returned. Abstracts should be in Turkish and English. 4. Key Words - Between 5-8 words. 5. Main Text - Quantitative and Qualitative studies should include Introduction, Method, Findings, Discussion sections. In the Method section, if a specific model is used, the model subdivision should include the Sample / Workgroup, Data Collection Tools, and Process subdivisions. Compilation type studies should reveal the problem, analyze the relevant literature in a competent way, emphasize the deficiencies, gaps and contradictions in the literature and mention the steps to be taken to solve the problem. In other studies, it can be modified according to the type of the subject but it should be careful not to be in the form of sub-sections in detail that will make the reader feel confused or difficult to use the text. 6. References - Both in the text and in the source books, the rules of writing specified in the book Publication Manual of American Psychological Association (APA) (6. edition) published by the American Psychological Association should be applied. For the use of basic texts used in bibliography writing, see the section entitled Basic Bibliographic Guides. 1. Tables and Graphs - Tables, graphs, images, graphics etc. elements should be in line with text. They should not be given at the end of the study additionally. (If the tables, graphs, images, graphics etc. elements are given additionally but not in the relevant places in your file, your application will not be processed and returned). Tables and graphs should be left justified and hyphenation should be deactivated. Title of the table should not be written on the it as a row in the table. 2. Appendix - Each appendix should be given in separate pages after references. 3. Other - Show p value only outside the table. Do not create a separate p column in the table. Show p values in text in italics. Table and graph titles should be edited accordingly. 2. Main Section Headings - Main section headings (Method, Findings, Discussion) and the title of the study should be capitalized and centered. (There is no heading for the Introduction section). 3. Subheading - Subheadings are capitalized and left justified; separated from the previous paragraph with a blank line. 4. Third Subheading - Should be left justified, 0,5 cm indented and bold. Should be written in sentence case (only first word is capitalized). Ends with a full stop, paragraph continues on the same line with the heading. It is not separated from the previous paragraph with a blank line. 5. Fourth Subheading - Should be left justified, 0,5 cm indented and bold italics. Should be written in sentence case (only first word is capitalized). Ends with a full stop, paragraph continues on the same line with the heading. It is not separated from the previous paragraph with a blank line. 6. Fifth Subheading - Should be left justified, 0,5 cm indented and italics. Should be written in sentence case (only first word is capitalized). Ends with a full stop, paragraph continues on the same line with the heading. It is not separated from the previous paragraph with a blank line. (It is suggested to avoid including more than fifth subheading). Headings - Table and graph expressions are directly used as Table 1, Graph 1. Table and Graph headings’ each word should be capitalized and italics. Table headings should be above the table, left justified, each word capitalized and italics. Graph headings should be under the graph, left justified and in sentence case. 1. Emphasis - Do not use bold in text. Emphasis should be done using “” or italics. 2. Bullets Order - For in text ordering, avoid using one under another as 1,2,3 and use side by side as (i), (ii), etc. 3. Direct Citations - Direct citations are written as left indented with 9 punto. They are not written in italics. Direct citations in a separate paragraph are not written in “”. Please use endnotes rather than footnotes. Endnotes should be marked by consecutive superscript numbers in the related part of the text, and listed at the end of the article.